Carole Osborne was recognized by the AMTA Council of Schools as the 2008 National Teacher of the Year, a high point as a somatic arts and sciences educator. 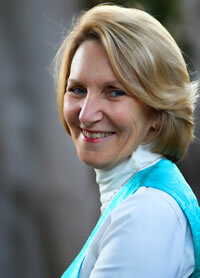 She has been an integrative body therapist since 1974. In addition to private practice, she has worked in osteopathic, psychological, and women’s medical settings. Her work focuses on facilitating somato-emotional and neuromuscular integration, particularly related to childbearing, trauma, substance and eating disorders, self-image, and nurturing. Her practice is located in San Diego, CA. Her earliest bodywork studies were with the Arica Institute, Milton Trager, and Tai chi with Master Abraham Liu, and in an apprenticeship with Edward Maupin, Ph.D. learning the structural approach of Ida P. Rolf. As her work has matured, she has developed a unique form of rhythmic deep tissue sculpting and begun incorporating osteopathic and neuromuscular soft tissue therapies. Carole co-founded the International Professional School of Bodywork (IPSB), in San Diego, in 1977, where she continues to teach. She has taught throughout North America and in Europe. She was a representative to the 1999 Massage Research Agenda Workgroup for the Massage Therapy Research Foundation providing input to formulating its 10-year research agenda. In 1980 she began collaborating with perinatal professionals and colleagues in researching and developing infant and maternity massage therapy protocols and instructional programs. She pioneered the reintroduction of therapeutic massage and bodywork to healthcare for the childbearing year. Over the years she has trained parents, hospital association staffs, and over 4500 maternity massage therapists. Carole has published two textbooks, Pre- and Perinatal Massage Therapy and Deep Tissue Sculpting, both in second editions. Her articles appear in many professional and mainstream publications. She was a major contributor to Teaching Massage. She provided consultation on several videos, and for other prenatal and infant massage media items and curricula at massage therapy schools. Penny Simkin and Phyllis Klaus’ book on pregnancy and sexual abuse survivors includes Carole’s input. She is a professional member of many organizations and is Nationally Certified in Therapeutic Massage and Bodywork. Carole is the mother of Josh and Elizabeth whose gestations, births, and lives inspired and continue to contribute to her work.